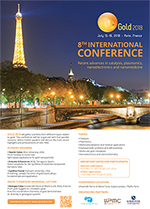 The Gold 2018 conference will be held on July 15-18, 2018 in Paris, France, on the renovated campus of the Pierre et Marie Curie University (UPMC), in downtown Paris, close to the Seine River and to Notre-Dame Cathedral. Gold 2018 is the 8th edition of the International conference series organized every three years, following Gold 2015 in Cardiff, Gold 2012 in Tokyo, Gold 2009 in Heidelberg... As a material, gold has experienced a renewed interest from the scientific community during these last decades. It started with the field of catalysis by gold nanoparticles, and it is now expanding to booming scientific areas such as homogeneous catalysis, plasmonics, materials sciences, biotechnology, nanotechnology and therapeutic applications. The science of gold has thus become a highly multidisciplinary field. During Gold 2018, specialists from these different topics will be given the opportunity to discuss the most recent highlights and achievements of their field, and also to get a comprehensive overview of the related areas of gold science in the parallel sessions of the conference.